Pro racers spend tens of hours a week beating the streets, and a common occupational hazard is skin cancer. David Cañada, 33 and currently signed with Fuji-Servetto, has discovered that a tumor removed in 2007 metastasized to lymph nodes in his armpit. 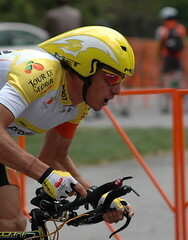 "I'm feeling quite encouraged and I'm really eager to return to professional cycling, if possible," said Cañada. "I'd rather not say goodbye to pro cycling this way, but it's obvious that my primary aim right now is to achieve a full recovery. I've already endured the hardest part of the treatment and I'm feeling really good physically." If you spend a lot of time in the sun, please remember to check regularly for skin cancer.